This bulletin was issued by the Publicity Committee of the Printing Crafts and Bert J. Snowden, president of the Printing Pressmen's Union. 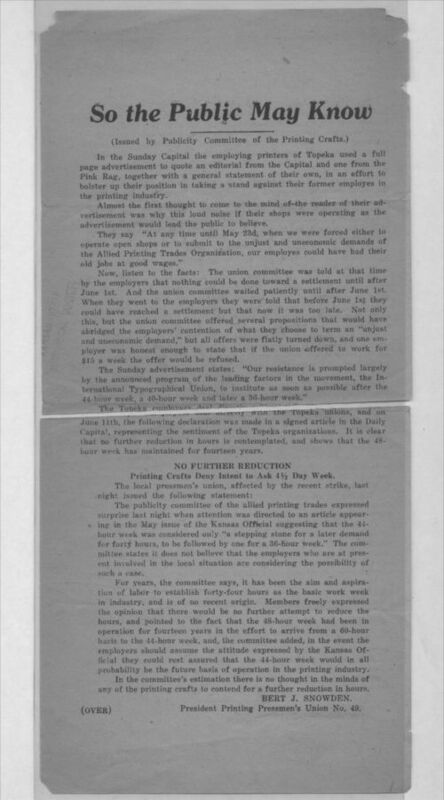 It is part of a series of bulletins published by the committee informing the public of the reason for the local pressmans strike, and explaining differences between the local pressmans union demands and the local typographical union demands. The bulletin was likely produced and distributed in Topeka, Kansas.